Most of us as parents have been there. It's been a long day, you're working your way through the evening routine and looking forward to bedtime, when your child suddenly starts complaining of pain in their mouth. This can be quite distressing - you're not sure if this is (yet another) stalling tactic before bedtime, whether this is a small thing or a big thing. Getting a good look inside your child's mouth can be a challenge at the best of times and all the dentists and doctors are shut for the night. Should you leave it and reassess things in the morning or will it just get worse? We take a look at 6 common causes of pain in kids and what to look out for. This is probably the main one that springs to mind and is still unfortunately quite common. Decay can sometimes be obvious to the naked eye but can also be very subtle. Decay that starts in between the baby teeth can get very large before the tooth ultimately 'caves in', giving the appearance that a hole has formed overnight. Thankfully, some of the time the pain in these cases is not from the decay itself but from the resultant food impaction between the teeth as we'll discuss below. Although finding decay will obviously require a prompt trip to the dentist for treatment, initial pain can sometimes be resolved simply by removing trapped food and debris from the area. New teeth erupting through into the mouth can be a common cause of pain which is usually transient. As seen in PICTURE 2, when a tooth is first coming through it may be covered by a flap of gum and can be almost impossible to clean. Bacteria or food debris getting underneath this flap can cause inflammation, resulting in pain and a red and fiery appearance. Pain often quickly resolves when the debris is removed and usually doesn't recur after the tooth is fully through. As well as the removal of food and debris, disinfection with a mouthrinse or salt water can be useful. 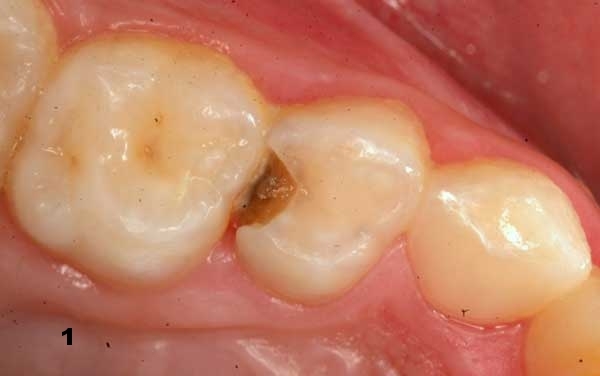 Hypomineralised molars are also quite common and represent a failure of the enamel covering of teeth to form properly. This can range in severity but can cause the underlying tooth to be sensitive to fluid, during function and to touch. The first permanent molars are most commonly affected and these usually appear at 6-7 years of age. Teeth often have obvious yellow or brown patches and may be prone to breaking down. Complaints of pain are often mild but persistent. Such teeth can be tricky to deal with in the long term and planning requires assessment from a dentist and sometimes from a dental specialist. Although it sounds like a minor problem, food trapping (impaction) in the spaces between teeth can cause a lot of pain and can escalate quickly. Sometimes there can be a cause for this trapping such as decay or broken teeth, but other times it can just be related to the natural spacing between teeth. Fibers of meat and fruit are commonly seen to be trapped and pain more often presents during the evening or at night. Removal of the trapped food particles leads to a rapid resolution of pain. Ulcers are a superficial breakdown of the lining of the mouth and can be very unpleasant. There can be a range of causes but most ulcers heal by themselves in around 10 days. As young children are not always able to communicate pain effectively, they may complain of a sore 'tooth', sore 'mouth' or simply avoid certain foods. Over-the-counter products from the pharmacy can help make children more comfortable while ulcers heal. Viral infections causing pain in the mouth are less common and can range from being very mild to quite dramatic problems as seen in PICTURE 6. Herpes group viruses can cause a condition called primary herpetic gingivostomatitis which involves very red, inflamed gums and multiple ulcers along with pain. Although this condition does resolve by itself, it can be quite distressing for a period of time and is very contagious to anyone who has not been exposed to the virus previously. After the right diagnosis is made, our advice focuses is on rest, trying to prevent infection of others and making life more comfortable for a child with a soft diet, paracetamol and over-the-counter preparations from a pharmacy as required. Dr. Aaron Martin is a registered dentist and principal dentist at Dentists of Alphington. Information in the above is broad in nature and should not be considered as any substitute for professional advice. Any concerns regarding pain or other problems in children should generally be assessed by a dentist or other health professional. We suggest examinations for children every six months in order to prevent problems occurring where possible. Read more about children's dentistry at Dentists of Alphington or Contact Us.